Comments: Shadows is a two-story frame house believed to have been built ca. 1825 by a member of the town¹s founding Scott family. A recently uncovered inner log wall indicates that a portion of the house is of even older construction. 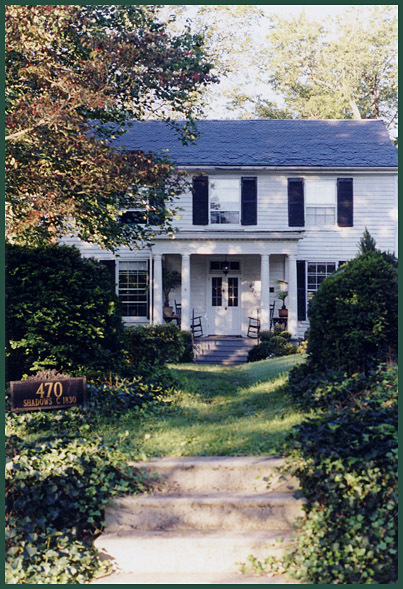 The earliest known owner of the house was Peyton Harrison who purchased the part of town known as the Harrison Addition and founded the Scottsville Presbyterian Church. He was the grand nephew of Benjamin Harrison, a signer of the Declaration of Independence. Also on the property are the original slave quarters and outdoor summer kitchen. The photograph above was taken by Gwynne Daye. Gwynne resides in Scottsville and is President of Scottsville Museum.